TIEC makes it easy to receive training on the go, whether you are on your laptop, tablet or phone. We offer the following courses. Utilize this link to sign up for classes. You will receive log in credentials that allow you to train at your own pace. Click on our Demo Course for more information. This online course provides an informative look at the requirements, interpretations and practical applications of quality management systems based on API Specification Q1 9th Edition. Over twenty topical lessons provide students with an in-depth understanding of the Specification. Case studies, examples, simulations, quizzes and exercises provide an interactive, contextual and practical learning experience. A final exam is provided at the end of the course. Estimated total time to complete the course is 5 to 7 hours. 1. One to five users is $500.00 per user. 2. Contact aaldworth@tiec.com for more than 5 users pricing. This online course provides an informative look at the requirements, interpretations and practical applications of quality management systems based on API Specification Q2. Over twenty topical lessons provide students with an in-depth understanding of the Specification. Case studies, examples, simulations, quizzes and exercises provide an interactive, contextual and practical learning experience. A final exam is provided at the end of the course. This online bundle courses saves you more which TIEC customers can take advantage of. You will get the same course content and interactivity with over twenty topical lessons for each course. Case studies, examples, simulations, quizzes, exercises and practical learning experience are all included. Likewise, a final exam is provided at the end of the course. Estimated total time to complete each course is 5 to 7 hours. 1. One to five users is $750.00 per user. This online course provides an overview of the general risk assessment process that could be applied to health, safety and environmental risks. Students will learn the risk assessment terminology and concepts. Students will learn how to use a risk matrix to assess risk and develop risk mitigation plans. Real examples of disasters are used throughout the course to provide context. The course consists of ten topical lessons, quizzes and a final exam. Estimated total time to complete the course is 90 minutes. 1. One to five users is $250.00 per user. The API Specification Q2 was developed, following the Macondo Deepwater incident, for service supply organizations in the petroleum and natural gas industry. The specification emphasizes a risk-based approach to assessing and controlling the risk of non-productive time. This online course focuses on the risk and risk assessment related sections of the Specification. The course consists of nine topical lessons, quizzes, an exercise and a final exam. Estimated total time to complete the course is 2 hours. The API Specification Q1 9th edition was developed, following the publication of API Specification Q2 to maintain consistency between both Specifications. 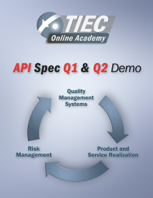 API Specification Q1 and Q2 emphasize a risk-based approach to assessing and controlling the risk of non-productive time. This online course focuses on the risk and risk assessment related sections of the API Specification Q1. The course consists of nine topical lessons, quizzes, an exercise and a final exam.